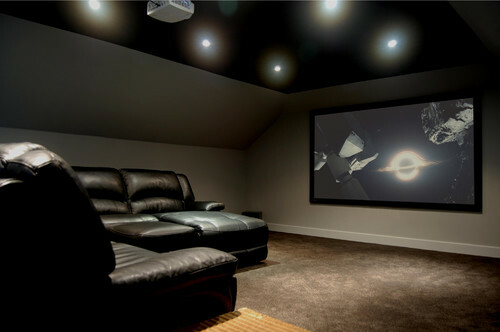 Our specialist team have recently completed the installation of an attic room home cinema system. Initial discussions took place during August 2015, followed by visits to a Kent based family home to finalize the design and specification for a home cinema system. The property owner wanted a large picture and decided upon a Projecta branded fixed screen and an Optoma HD projector. We specified an acoustically transparent screen material, allowing for the PMC Wafer 1 in wall speakers to be mounted inside the framework of the Projecta screen. The attic room is a healthy 6m x 8m in size. As a result, two JL Audio D110 were specified to underpin the front three (Left, Centre and Right) PMC speakers. KEF Ci200QR in ceiling speakers were installed as rear channel speakers and painted black to blend with the ceiling for a subtle look. At the heart of the home cinema system is a Yamaha RX-A1050 AV Receiver and Yamaha BD-A1040 Blu-ray Player. A SKY HD satellite receiver and X-Box One complete the system to provide a complete entertainment solution for the home owner and his young family. The owner is very happy with the end result and is regularly subjected to watching the Blu-ray version of Frozen by his young family!